Litvish and Chassidish and National Relig-ish. Breslov-niks and Kook-niks and Aish-niks and Chabadniks. While I draw inspiration from all of the above, more than anything else I am a dyed-in-the-wool and darned proud Yemima-nik. And I’m not alone. Rabbanit Yemima Mizrachi has tens of thousands of students. A major Israeli newspaper, Makor Rishon, just named her the “3rd most Influential Religious Woman in Israel” and she is widely recognized as the most popular Orthodox female lecturer in Israel. Furthermore, I want to clarify that if I have every said or written anything that has inspired you, you have Rabbanit Yemima to thank. This blog and JewishMom.com is little more than a slanted mirror that reflects out to the English-speaking world the tremendous light that is HaRabbanit Yemima Mizrachi. Rabbanit Yemima went on to explain that it is permitted to give children a light slap on the hand in three cases: 1. When a child hurts animals 2. When a child is violent towards others 3. When a child uses filthy language. And that is what is so ridiculous and borderline surreal about this whole story. 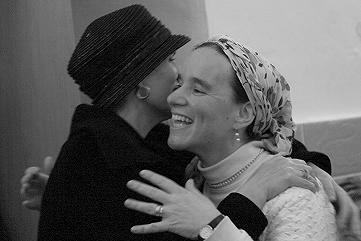 Today, thousands of mothers, including me, are better and more devoted mothers to their children because of Rabbanit Yemima Mizrachi, who teaches us that every Jewish child is the Holy of Holies. So in the name of all my fellow Yemima-niks AND our children as well, I want to take this opportunity to say thank you, Rabbanit Yemima. For everything. Click to register to watch Rabbanit Yemima’s Weekly Class (In Hebrew, occasionally with English subtitles). It is indeed laughable that anyone could say that Rabbanit Yemima incited to violence against children. I would suggest one more case when hitting a child may be necessary and appropriate – when a child endangers himself, for example, running into the street. That is the only time my husband ever hit our children. I agree with you that R. Yemima shouldn’t be attacked so harshly. I also sympathize with Kadman for taking a firm line on physical punishment. If a light slap on the hand will suffice, it’s not necessary either. And hitting a child for hitting is sending the wrong message. Parents in the heat of anger are not always able to limit themselves to a light tap, and children definitely don’t distinguish between light and hard hits–whether they are the ones getting hit, or the ones doing the hitting. Children can be taught not to run into the street without physical punishment, just like they are taught everything else. Parents can show their alarm with their voice and body language. it says page not found when you click the link to register for the weekly videos that sometimes have english subtitles. can you tell me what the updated link is to do so? thank you!